The easternmost part of Crete, Lassithi prefecture offers a blend of sophisticated seaside resorts, Minoan and Mycenaean ancient sites, and unspoiled natural areas that include dense palm forests and the island's largest plateau. A standout among the prefecture's notable places to visit, the vibrant town of Agios Nikolaos features a string of sandy beaches and a museum of archaeology. 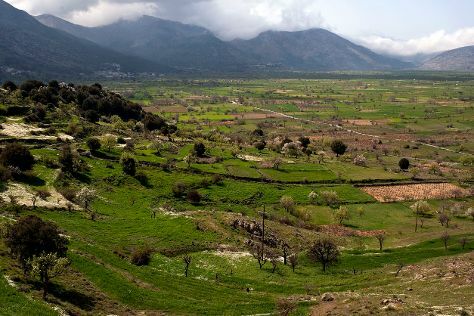 The town also serves as the starting point for tours of one of Crete's most significant Neolithic sites, originally inhabited over 4,000 years ago. Farther inland you can discover a less-traveled side of Crete, where the major tourist attraction remains the traditional village tavern. Lasithi Prefecture is in Crete. Take a peek at our online itinerary creator: Lasithi Prefecture and its charms laid bare and easily scheduled.